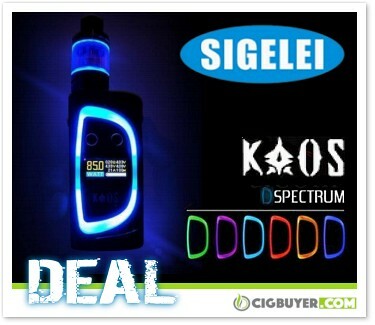 Sigelei Kaos Spectrum 230W Starter Kit – ONLY $31.50!!! One of the hottest devices of 2017, while supplies last you can get an outstanding deal on the Sigelei Kaos Spectrum 230W Starter Kit at US vendor Ecig-City for only $31.50! The Sigelei Kaos Spectrum Mod is powered by dual 18650 batteries and boasts up to 230W of output with full temperature control (Ni/Ti/SS/TCR). It includes a large 0.96 inch color TFT display that provides a wide array of data, but one of the coolest features is the variable color LED ring that illuminates the device whenever you desire.